Instrument/Discipline : Piano/Chant/Guitare Style/Genre : Jazz Support : Livre Auteur/Compositeur : GARDOT MELODY Un beau mélange de jazz, blues, et pop qui fait écho à des légendes telles que Peggy Lee et Billie Holiday. 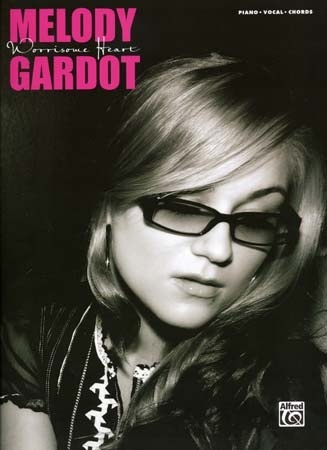 Cet album de Melody Gardot est un véritable travail d'artiste. Un beau mélange de jazz, blues, et pop qui fait écho à des légendes telles que Peggy Lee et Billie Holiday. Cet album de Melody Gardot est un véritable travail d'artiste. Partitions pour piano, voix, guitare (grilles d'accords) de l'album 'Worrisome 'Heart' de la jeune chanteuse américaine Melody Gardot. Du jazz vocal teinté de Folk, je vous laisse en compagnie de cette chanteuse de jazz?la télévision depuis 1924. Ici ce sont les partitions pour piano, voix et guitare (grilles d'accords). Inclus un historique de la société.lee since 1966, before which he toured with Lionel Hampton and Woody Herman. He has taught thousands how to improvise. can also use MicNotator to play your instrument in, or scan existing sheet musicBand-In-A-Box auto harmonizingExercise Wizard ? instantly generates practice pieces ? for your entire band, orchestra or choirVideo support ? import video plus send and display SMPTEShare Your MusicPlayback ? here are just a few reasons why Finale?s sound is unsurpassed:Record or import an audio track for unprecedented realismMore than 350 world-class Garritan instrument soundsMore than 100 sounds from Tapspace Virtual DrumlineHuman Playback makes your music sound like musicians are playing itIntegrated Garritan Aria player.Save audio filesCreate SmartMusic accompanimentsMore than 300 customizable and printable Music Education WorksheetsFree, downloadable Finale Reader lets your share your Finale files with anyoneLinked PartsSupports Windows XP/Vista and Mac OSX 10.4 and 10.5.Why is Finale the world standard? These exclusive features are not available in any other music notation software:Record or import an audio trackCreate SmartMusic accompanimentsBand-In-A-Box auto-harmonizing ? automatically generates up to 6-voice harmonies for your melodiesExercise wizard ? instantly generates up to 50,000 practice pieces for your band, orchestra, or choir without entering a single noteStudio View ? an all-in-one environment for multi-track music creationFree, downloadable Finale Reader lets you share your Finale files with anyone who can then print, play, edit and save!MicNotator lets you enter notes by playing youian Dub Foundation.you create setups to suit your specific control needs in all three models.nanoPAD - A Small Pad Controller That's Big on ControlWhen Korg set out to make a drum pad controller, they did their homework - with unique features and exceptionally responsive pads, the resulting padkontrol became and remains one of the most highly sought-after pad controllers on the market. Enter the nanoPAD, offering 12 excellent feeling and highly responsive pads in a new, smaller footprint. In addition, a new Chord Trigger function lets you enter chords onto a single pad, helping you to make the most of the work surface as you create. The pads are also able to transmit control change messages, making this a great interface for soloing or muting mixer tracks, turning objects on and off, or triggering clips during your live performances.nanoPAD's X-Y pad offers 'Roll' and 'Flam' modes, to help you lay down ultra-realistic drum grooves. The X-Y pad will also send MIDI CC (Control Change), making it a go-to interface for any parameter within your software that requires full range MIDI control such as pitch, cutoff, volume and beyond.With the 'KORG KONTROL Editor' (downloadable free of charge from the Korg website) you can customize four scenes that address the pads and X-Y pad can be stored within nanoPAD to suit your control needs. That means you actually have access to 48 notes/chords, 60 MIDI controllers, or any combination of the two types of data at any given time. Also, select one of three velocity curves or a fixed velocity to tailor the nanoPAD to your touch.ilable scenes.ormance options.u'il attendait d'être osculté. By Melody Gardot. Melody Gardot. For Piano/Vocal/Chords. This edition: Piano/Vocal/Chords. Personality Book. Book. 56 pages. Published by Alfred Publishing.